Before I jump into my thoughts, I have an interesting Q & A with the author after the review that you won’t want to miss, so please check it out. This read much like an episode of Criminal Minds which I mean as a huge compliment as it’s one one of my favorite shows. My husband and I have watched every single episode from all twelve seasons, so to say that I’m a fan is putting it mildly. I was initially grabbed by the blurb because it sounded so similar, and though it definitely is, this book is unique enough that it stands out on it’s own. It’s also the fourth book in Heiter’s Profiler series, but I haven’t read the first three books and had no issues catching up. The opening definitely pulls the reader in, Haley has been missing for thirty days and the FBI in the form of Evelyn Baine is called in for assistance. Right away a missing piece of evidence is discovered, a note from Haley saying, if you’re reading this, I’m already dead. It certainly upped my interest and added something dark and sinister to the story. What follows as Evelyn and a local police officer, Sophia dig into Haley’s life is a web of secrets and shocking revelations. Heiter is a skilled writer and the level of detail she adds is astounding, you can tell she really knows what she’s talking about as far as the profiler stuff is concerned. Though there is so much going on and so much information is being relayed, I was never bored. Quite the opposite actually, I was fascinated. There were tons of characters to work through making trying to figure out who the culprit is even tougher for Evelyn and the reader. The plot was complex and intricate with a great deal of thought put behind it and the characters were also well developed. I liked both Evelyn and her boyfriend Kyle, both separately and together and I know I’ll enjoy following their story as the series continues. The suspense was slow burning, but mounting throughout and it definitely ramped up towards the end and the conclusion provided clear cut answers and nicely executed twists. Thanks to Emer at MIRA for my review copy. I write almost every day, and I always begin by editing what I wrote the day before. Typically, I’m writing one book, revising another, and researching a third at the same time. My perfect writing environment is either sitting in a coffee shop and playing music over my headphones or sitting in my dining room with a parrot on my shoulder. Regardless, there’s always a mocha latte beside my computer. I honestly can’t remember a time I didn’t want to be a writer. I think it comes in part from having a mom who read to me a lot as a child. Before I could write my own stories, I’d tell them to her (and insist she also make some up for me – for a math teacher, this was a challenge, but she did it!). Once I could actually start writing, it was all over. Long before I was published, I was reading my stories to any family/friends who would listen. This list could be enormous! Some of my big influences over the years have included Shakespeare (mystery, drama and romance all in one), the Brontës (atmosphere), Lisa Gardner (great twists and strong, female-driven stories) and Tom Clancy (extreme attention to detail). 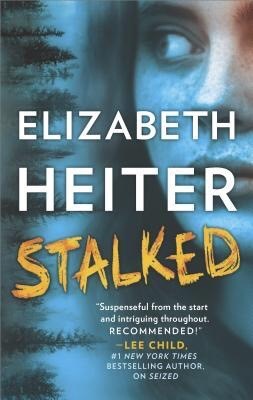 STALKED, the next book in my Profiler series, hits stores on December 27th. When a high school student goes missing from inside her high school, leaving behind a note foretelling her own death, FBI profiler Evelyn Baine is called in to unravel the case. Everyone in the girl’s life seems to be hiding secrets, from her step-father to her boyfriend to her best friend. The deeper Evelyn digs, the more she realizes that uncovering Haley’s fate could be the death of Evelyn herself. After STALKED, I’ll be releasing a new trilogy of stories in my romantic suspense series, The Lawmen. As children, three orphaned boys formed their own family. Years later, these lawmen try to unravel the secret that separated them so many years ago. Every story is a little bit different. For The Profiler series, the idea originally came to me because I’d read a book about criminal profiling by a former FBI profiler. I was fascinated by the idea that someone could go to a crime scene with no suspects, no useful forensic evidence and no promising leads, then look at the behavioral clues the perpetrator didn’t know he’d left behind in order to form a picture of who did the crime. I loved the idea of writing a character like that and Evelyn Baine was born. Now that she’s an established series character, plot ideas are sometimes inspired from real-life events (such as STALKED), sometimes by where Evelyn is on her character journey (such as SEIZED) and sometimes by what I’d put in her past (such as VANISHED). Developing each story usually involves me asking “what if…” over and over again (usually while I pace). Eventually, as I discard the obvious choices and get excited over new twists, the story outline is born. It’s hard to choose a favorite, but I do have a soft spot for Evelyn Baine. In the first book of the series, part of what I wanted to explore was how two people who came from similar hardships as children could end up in such opposite places (Evelyn joined the FBI and the person she’s chasing became a serial killer). Evelyn was driven to join the FBI after her best friend went missing when she was twelve years old and was never found. Evelyn begins the series closed-off and so focused on that goal that she forgets to live her life. Slowly, as the series develops, she grows into a character who’s willing to take more chances, including dating the agent who has been pursuing her from the beginning. I love hearing from readers however they want to chat! They can email me through my website at http://www.elizabethheiter.com or chat with me on social media (www.facebook.com/elizabeth.heiter.author and http://www.twitter.com/ElizabethHeiter). Right now, I generally block about six months for my suspense books and three to four for my romantic suspense (which are shorter). But that’s just the actual writing part. Before that time begins, I’ve already completed most of my research (because I’m doing it as I write the previous book) and I have a bullet-point outline of the major plot points and character changes throughout the story. 9. Which one of your characters do you relate to the most? In many ways, I really relate to Evelyn (which may be why she’s my favorite). We’re similarly driven (I’ve always wanted to write and everything can be fodder for a story). As a child, stories were also an escape – a way to experience a different life and to see a world where justice would prevail at the end. I’ve always wanted to write strong female characters and to me, Evelyn embodies that. She may not be the stereotypical badass woman, but she has an intellectual strength (and she’s also got that FBI training, so suspects shouldn’t underestimate her)! After college, I got scholarship offers for law school and I held onto one of them (deferring admission) for a year because I was torn – I was really interested in the law, but I worried that the hours required in the job I wanted (public interest, helping women in children in particular) would leave little time to write. But if I wasn’t so obsessed with writing books, I might be a lawyer – and from there, I probably would have applied to the FBI. Almost every time I interview a Special Agent, they tell me I should apply! I have two favorites. The first is when people finish my books and ask if I was ever in the FBI, which tells me that my story rings true to them. The second has been from people who have experienced whatever I’m writing about, and told me it helped them deal with their own past (e.g., a sexual assault survivor who read one of my romantic suspense stories and told me it was cathartic and empowering). It’s one of the reasons I love to write – to do for others what stories have done for me. There’s nothing quite as moving as when I succeed at that, whether it’s helping someone deal with their own experiences or just providing an escape. Oohh I think you will too!